BIO Fast HD | Richen Europe S.r.l. Helicobacter pylori is a bacteria that can colonise the mucosa of the stomach and increase the inflammatory processes over time until the lesions become pre-cancerous. It is present in 20% of people under 50 years of age and in 40% of senior citizens. Determining its presence quickly and safely is an important objective during the gastroscopy exam. Methods for the diagnosis of Helicobacter pylori infections can be classified as either invasive (gastroscopy with biopsy) or non invasive (breath test, identification of the antigene in feces or anti-bodies in blood). The method of reference to diagnose Helicobacter pylori infection, remains, for now, the gastroscopy exam because it gives the doctor a clearer picture of possible lesions in the lining of the stomach and at the same time the possibility of collecting a sample of tissue which can then be analysed with either histologic methods or utilising the BIO Fast HD (urease test on the biopsy sample). Helicobacter pylori possesses an enzyme, urease, that breaks down the urea. 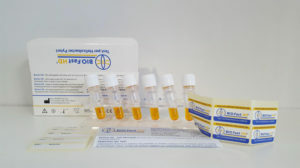 BIO Fast HD foresees that the biopsy sample is put in the test tube containing the urea detector solution, with which variations of pH in the liquid can be noted. If it varies, this means that the urea has been broken down and that Helicobacter pylori is present in the biopsy sample. Better identification of colour toning and therefore better capacity of the reading for pH intermediates. PPI medicines (Proton Pump Inhibitors) reduce the acid secretions in the stomach and negatively influence and weaken the activity of the urease enzyme present Helicobacter pylori, whose activity is the basis of the reaction of the rapid tests. Where PPI medicines are taken the capacity of the urease enzyme to “burn” the urea contained in the medium is significantly reduced, consequently determining a lower production of ammonium, thus a weaker change in the increment of the pH. This increment, resulting little elevated, determines a significant reduction of the colour on all the other tests different from the BIO Fast HD, moreover also less distinguishable by the human eye, as it changes colour through the pink intermediary (phenol red). The BIO Fast HD is much faster in the reaction for structural reasons of the composition, so needs an inferior increment of pH to be able to change colour, which is also better distinguishable spectro-photometrically to the human eye, when the light pink of the biopsy turns green-blue, through the use of bromotilo blue whose colorant is suitable for the purpose.